Think you’ve got what it takes to be the best Pit Master in town? Well come on down and prove it! 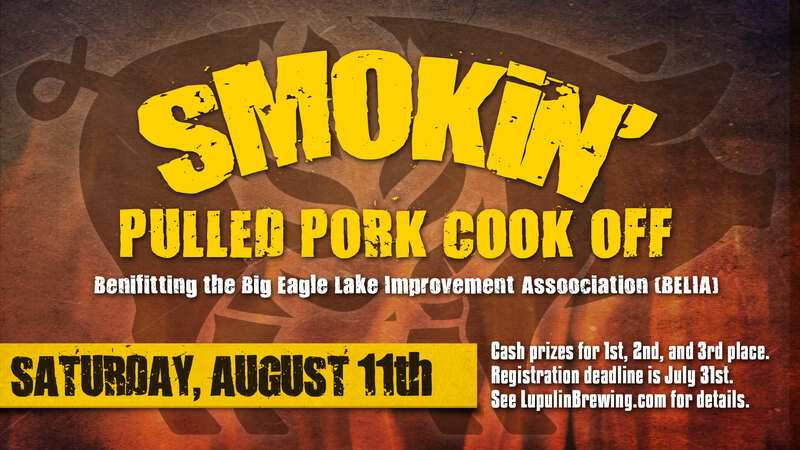 Lupulin Brewing, in conjunction with the Big Eagle Lake Improvement Association (BELIA) are hosting a smoked pulled pork cook-off on August 10-11th. Bring your best recipes for smoked pulled pork to be sampled by the public and an esteemed panel of local judges. Prizes will be awarded for 1st, 2nd, and 3rd places along with a People Choice Award. Interested in participating as a competitor? Download the PDF here for complete rules and deadlines. Want to just come to the taproom and taste a bunch of great smoked meat while have some great beers to go with it? Simply come on down to the taproom Saturday, Aug 11th and you can purchase tickets for food such as the pulled pork sandwiches, baked beans, and potato salad.